Special Guest: My buddy John. Go check out his bar or his dance club sometime. Snacks: Hanger 24 Orange Wheat, King’s Hawaiian Dog. Memorable Moment: Seeing Kenley Jansen break the Dodgers’ all-time saves record. There’s no Obscure Jersey Award for this game. Only a BEST Jersey Award and that goes to the guy rocking the custom Nancy Bea. 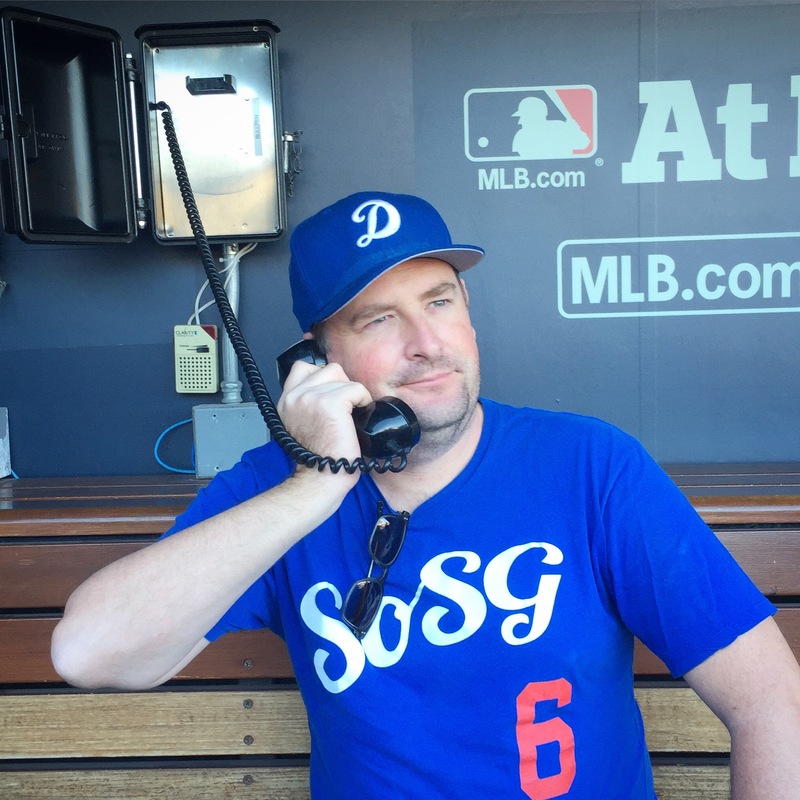 RECAP: I’ve been going to Dodger games with my buddy John longer than anyone I know. We’ve been at the stadium for some big games and some infamous ones, such as that time we had an extremely up close view of Milton Bradley when he tried to fight every fan along the right field line. 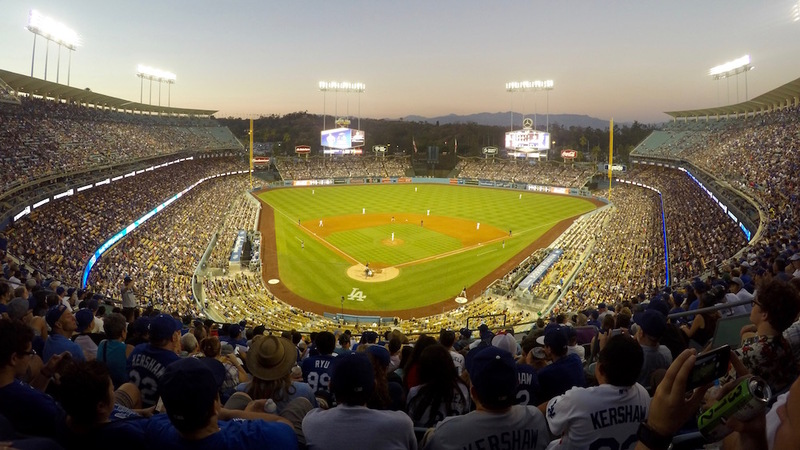 Last season, and almost a year to the day of this game, we saw the Dodgers win 1-0 on a walk-off balk. A group of tourists form Spain sat to next us that night and I really wish I would have recorded our attempts to explain the concept of a balk in broken Spanish to people who knew nothing about baseball. It was comedy gold. 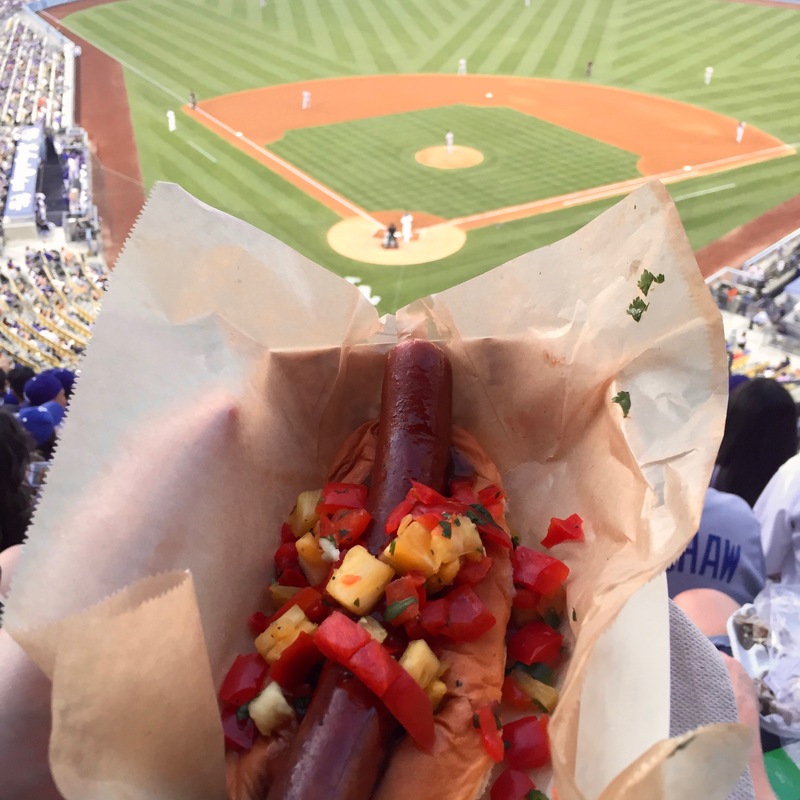 The King’s Hawaiian Dog. I knew better than to try and mix spicy mustard with mangoes. Tonight though promised a marquee matchup between Clayton Kershaw and Stephen Strasburg, that is until Strasie (is that even his nickname?) chickened out due to an upper-back strain. 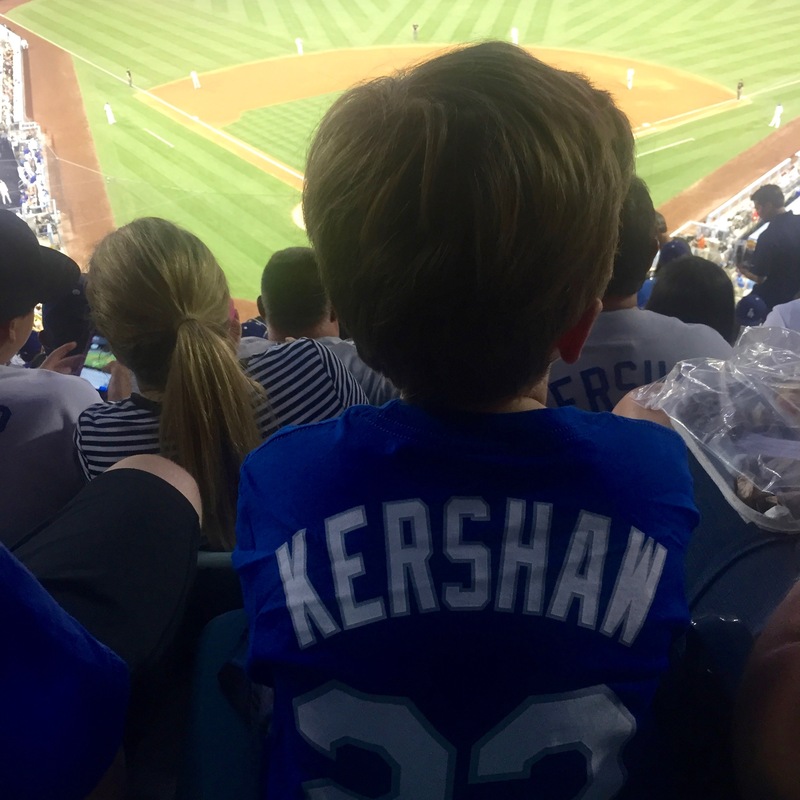 This kid sitting in front of me was so pumped to see Kershaw on the mound. When he wasn’t hanging on his every pitch, he plowed through pizza, Dodger Dogs, and ice cream and pretty much had the best day ever. A couple minutes after Kenley’s final pitch, he raced back to his seat to retrieve his Cooler Backpack but it was already gone. I couldn’t let the kid’s night end on that note, so I did my best impression of a responsible grown up and insisted that he took mine. 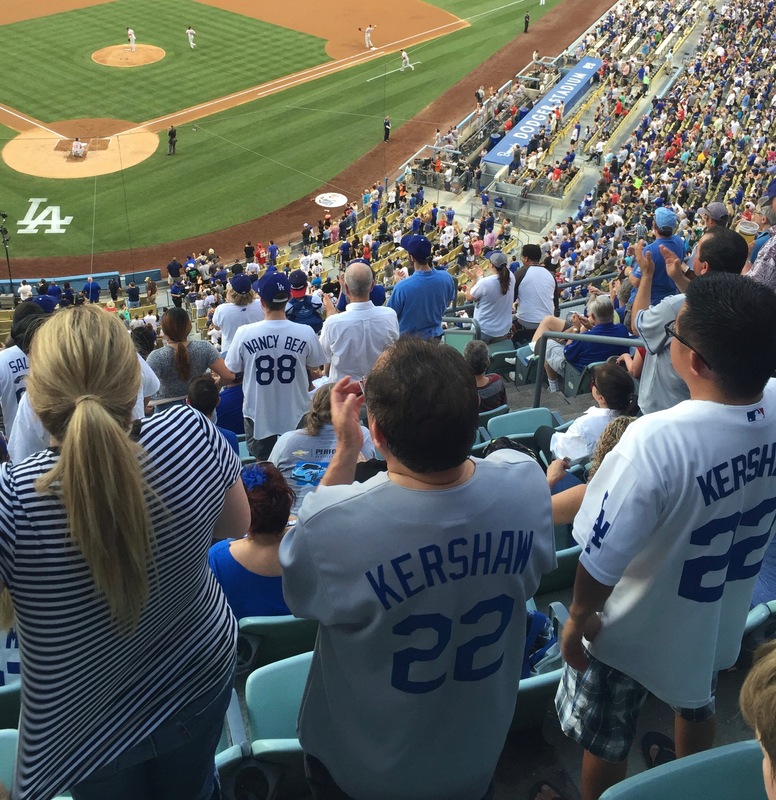 Instead, Kershaw got to face Yusmeiro Petit and the Dodgers quickly made life miserable for the substitute pitcher. Justin Turner got the fireworks started by hitting a ball to South Pasadena in the first and Joc Pedersen launched a solo shot somewhere over the 5 in the fifth. Meanwhile, Kershaw was mowing down Nationals as soon as they stepped to plate. He struck out Bryce Harper all three times he faced him and gave up only one run in seven innings of work. 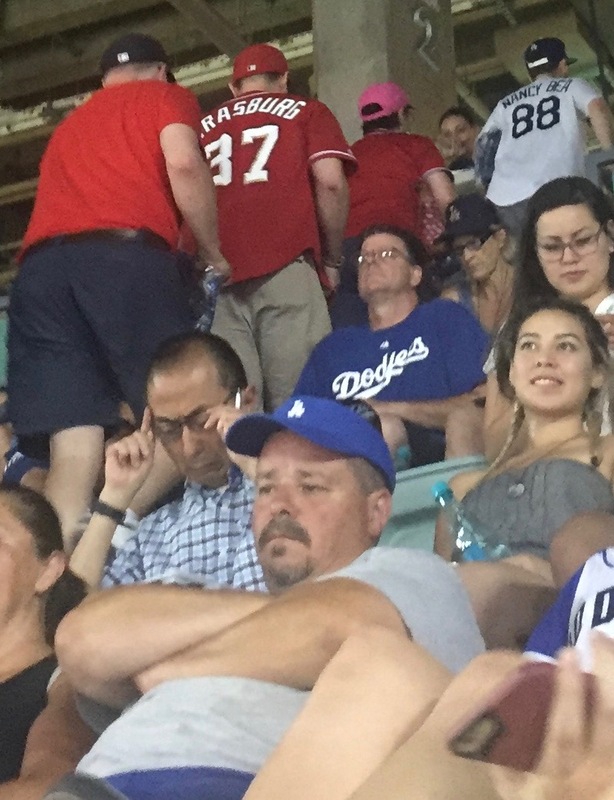 Kershaw’s dominating performance sent Nationals fans to exits before “Nancy Bea” even made it to her organ for the seventh inning stretch. Joe Blanton held down the fort in the eighth which meant Kenley Jansen would have a chance to break Eric Gagné’s saves record. Kenley struck out the first two batters he faced but then Anthony Rendon had to go and ruin the trifecta by hitting a little dribbler to Corey Seager for the final out. It was a nice bit of history to see on a Monday night.